For many investors, retirement planning conjures up fantasies of beachside homes and traveling around the world. At the Teacher Retirement System of Texas (TRS), it’s all about three modest staples of a trip to the grocery store. According to LeBlanc, the TRS pension fund serves more than a million public school employees in the Lone Star State. It’s not the wealthiest group of clients, but he says his job has a “sense of purpose and giving back” that he values. The economic turmoil of the last five years around the globe has created unexpected challenges for pension fund managers like LeBlanc. During that time, REITs have played a key role in TRS’s strategy for coping with the attending market uncertainty. LeBlanc has an extensive history in the commercial real estate industry. Previously he served as president and CEO of NYSE-listed REIT Summit Properties in Charlotte, N.C. 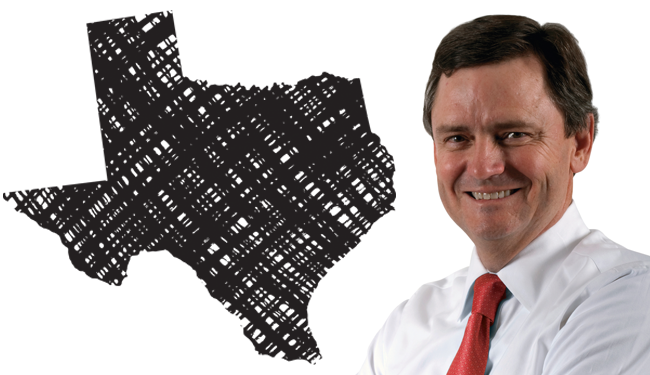 He also held the positions of president of Urban Growth Property Trust in Chicago and executive vice president for Archstone Communities Trust, the predecessor to Archstone-Smith Trust, in Santa Fe, N.M.
LeBlanc, who announced in April that he would be leaving the TRS of Texas to pursue a position in the private sector, has overseen TRS’s real assets, private equity and principal investments portfolios. The fund’s total real estate allocation is $15 billion. Of that amount, $2 billion is allocated to REITs. TRS has been in existence since being enacted by the Texas state legislature in 1937. Originally, only teachers could participate in the System. All employees of public educational institutions gained eligibility in 1949. Today, the System has 1.3 million participants and net assets in excess of $110 billion, making it the sixth-largest public sector pension system in the United States. The retirement fund aims for an average annual return of 8 percent. Since 2003, it has met that goal in every year but two, 2008 and 2009. Last year, TRS had an annual rate of return of 15.5 percent. LeBlanc attributes the strong performance to his team of investment professionals. While working within the compensation limitations of a state retirement plan, LeBlanc says one way he attracts talented financial advisors to work for TRS is by helping his employees “perfect their ‘personal genius.’” According to LeBlanc, everyone has a skill for which they are in the top 20 percent in the world at performing, which he defines as their personal genius. He says emphasizing personal genius over the “any door, any floor” mentality pervasive in the financial industry gives the TRS a leg up on hiring talented employees. That team of geniuses helped LeBlanc devise what he considers to be a “unique” strategy to manage the pension fund. LeBlanc points out that pension plans such as TRS have greater sensitivity to inflation, given the constituency that they serve. Hence the reference to being in the milk, bread and eggs business. “The worst thing that can happen to our beneficiaries is high inflation,” he says. Consequently, his fund doesn’t employ some of the more common asset allocation approaches, according to LeBlanc. To help guard against inflationary erosion, TRS places a special emphasis on real assets. TRS includes a strategic allocation to REITs along with other real assets as part of its inflation-hedging program. REITs’ liquidity offers a significant advantage over private real estate investment, according to LeBlanc. The ability to buy and sell REITs instantaneously on the publicly traded market means that the fund has flexibility in its REIT allocation that private investment can’t provide. Additionally, LeBlanc says he values the transparency of the REIT market. LeBlanc admits that one concern when it comes to the REIT investment proposition has been the industry’s volatility. That’s a real drawback for some of his peers, he says. “A lot of defined benefit plans don’t invest in REITs because they don’t have the emotional discipline to sustain the volatility,” he says. LeBlanc notes that the issue of volatility became a major headache for pension fund managers when the financial system went haywire in 2008. "REITs have played a key role in TRS’s strategy for coping with the attending market uncertainty." A number of key lessons have emerged from the Great Recession for TRS and LeBlanc’s team. He says they all learned the importance of maintaining an “emotionally disciplined” investing strategy. Part of that requires sometimes ignoring what other people think when making investment decisions. That sense of confidence spurred TRS to make two big bets that have paid off in a major way for the fund in the last three years. In one case, the pension plan bought a $400 million portfolio of properties from industrial REIT Prologis Inc. (NYSE: PLD) in March 2009 as the stock market was in the process of bottoming out. LeBlanc estimates the portfolio has appreciated roughly 40 percent since TRS purchased the properties. TRS went out on another limb soon thereafter by taking a major position in then-bankrupt GGP Inc. (NYSE: GGP), one of the commercial real estate industry’s most prominent mall owners. The investment has since yielded substantial returns as the mall REIT has emerged from bankruptcy. “We knew those high-quality fortress malls were a phenomenal investment,” LeBlanc says. Through the ups and downs, LeBlanc says his faith in the REIT approach to commercial real estate investment has never wavered. On the other hand, LeBlanc says the same can’t be said for some of his peers in the defined benefit plan arena. REITs still struggle to get their due in his corner of the investment world, LeBlanc says. He points out that a number of defined benefit plans remain only invested in private real estate. Without question, according to LeBlanc, REIT investment should pick up among pension funds and other defined benefit plans.